The timing would give caucus and the new leader time to settle in prior to next year’s general election, he said. It was “the hardest decision I’ve ever made,” he said. . .
My first reaction was disbelief then sadness. John Key took on the party’s leadership as it was on the way up in popularity and built on that. He led the party to three election victories and has been at the head of a government which has maintained unprecedented levels of popularity. I first met him when I was National’s Otago Electorate chair and was very impressed with him. What I saw then, the intelligence, approachability, and both interest in and concern for people, have been signatures of his leadership of the party and the country. When he became Prime Minister New Zealand was facing a decade of deficits. He and his team, not least of all his deputy and Finance Minister, Bill English, have turned that round and projections now show growing surpluses. He has led a strong united caucus and party. The mutual respect between the parliamentary and voluntary wings and party staff is unquestioned. That won’ change under a new leader. The commentariat and opposition will be delighted and think this will help change the government next year. But the party’s strength and unity will continue under the new leader as will its compassionate conservatism and policies which work for all New Zealanders. My initial reaction was sadness. I still feel that, but I am also optimistic about the party and the government, and the new leader, whichever of the several able candidates that will be. Just a few days ago I marked the anniversary of my eighth year as Prime Minister and my tenth as leader of the National Party. Throughout these years I have given everything I could to this job that I cherish, and this country that I love. All of this has come at quite some sacrifice for the people who are dearest to me – my family. There’s a video of the speech on Facebook. Will Labour complain about this too? The latest Australian Women’s Weekly has a cover story about John and Bronagh Key and Phil and Mary Goff. The stories are about the couples and their relationships and each concludes with a Q&A with the MPs. It’s a little heavy on gush which my, admittedly rare, readings of the AWW suggest is not unusual for this magazine, but the stories do show something of the people behind the politicians and both are treated equally. But I bought the magazine because I saw the Keys smiling at me from the cover. It was only when I went to read it that I noticed the Goffs in the corner. Will Labour follow up their complaint about the PM’s RadioLIVE slot with a complaint about the unequal cover coverage too? Apropos of the complaint, Labour would have been on much stronger ground complaining that the radio programme breached electoral or broadcasting rules had Goff not asked to host a show too. Dim Post has something else for someone to complain about..
12:34: I do love a lovely wedding, and this was a really lovely one. They look happy, I hope they are. 12:32: Everyone back into the palace. 12:29: A second kiss. Very decorous, a peck rather than a snog. 12: 27: The Queen leads other members of the royal family onto the balcony. The crowd is excited. They kiss (Kate and WIllaim that is, not the crowd). 12:26: The Duke and Duchess are on the balcony waving. 12:25 Net curtains on the palace window behind the balcony – tell me no! 12:22: The Brits do secuirty and crowd control well too – all those people and no sign of anything untoward. 12:05: Photos here and here. 12:03:Offical royal wedding pages here. 11:59: Three hours of bell ringing might be a wee bit much for most people, not least those doing the ringing. Wonder if they wear ear protection? Do they do it in shifts? 11:44: The Brits do do pomp and ceremony well, don’t they? 11:34: They’re calling it the wedding of the century – it’s been glorious but with 89 years (90 if you’re a pedant) to go that’s a big call. 11:26: It’s not easy getting out of a carriage gracefully in a long dress and a longer trains, but she does it. 11:25: Back at the palace. Those are very well behaved horses. 11:20: There’s a reason for that royal wave – the royal arms would get very tired if they did too much ordinary waving. 11:11: The sun is shining, they’re smiling and waving to the crowd. 11:09: WIlliam puts on his cap and gloves. Into the carriage. 11:08: They walk out of the Abbey to cheers from the crowd and the peal of bells. 11:05: They bow and curtsy to the Queen. 11:04 Prince WiIliam and Princess Kate (or is it now Princess Catherine? ), the DUke and Duchess of Cambridge, return to a fanfare. 11:03 The clergy go to the door. 11:02: The families return. The choir is still singing. 10:53: Pippa gives Kate her bouquet, they walk forward into a chapel, followed by their parents and siblings, to sign the register. The choir sings. 10:52: God Save the Queen. She doesn’t sing but Prince Phillip does. 10:50: Another prayer.The choir sings Amen. 10:47: Hymn – Jerusalem. Elton John doesn’t seem to be over familiar with this either. Many in the crowd outside are singing more enthusiastically. 1044: Prayers– I know Roman Catholics don’t say the last bit of the Lord’s Prayer (for thine is the kingdon . . . ) but didn’t realise Anglicans don’t either. 10:40 The choir sings while WIlliam and Kate move to the, is it the nave? Pardon my ignorance of church architecture is showing. No it’s not the nave, it’s the alter. 10:39: He finishes with a prayer which William and Kate wrote. 10:32: Address by the Bishop of London. He starts quoting Saint Catherine of Sienna – Be who you are mant to be and you will set the world on fire. 10:27 Anthem This is the Day The Lord Hath Made, commissioned specially for the service as a gift to th couple. 10:24: Bible reading by James Middleton- Romans chapter 12. Let love be genuine, hate what is evil, hold fast to what is good . . . Either he’s using a teleprompter or he’s got a very good memory. 10:17: A ring for her but not for him. 10:12 Dearly beloved –the Dean begins the service with the traditional words. 10:11 Sophie’s veil is off her face, she looks happy. 10:10: The first hymn – Guide Me O Thou Great Redeemer. Elton John doesn’t appear to know it. 10:09: Harry looks nervous, William looks happy. 10:08: What restraint – William hasn’t glanced back yet. 10:05: Kate, her father and the Dean walk slowly down the aisle. Her veil is over her face. 10:04: William and Harry are led to the alter steps as the choir sings I Was Glad. 10:03: Is that a tear in her mother’s eye? 10:00: It’s 11am in England. Kate and her father have arrived at the Abbey, PIppa is coming out to greet her. Kate’s dress is simple and elegant with a train which is several metres long. It was made by Sarah Burton for Alexander McQueen. 9:59: All that waiting by all those people who cheer as the bride and her father glide past in seconds. 9:56: Pippa Middleton (stunning in a sleek, champagne coloured gown), the flower girls and page boys are going into the Abbey. 9:51: Kate Middleton, wearing lace and carrying a posey, has got into the car with her father, Michael. My, what a long train. 9:49: The Queen and Duke have arrived at the Abbey. Her outfit looks more subdued inside. She gets a fanfare fromt he band and a kiss from her son. 9:48: Two page boys in mini-military uniforms. 9:44 Charles and Camilla are going into the Abbey. 9:43: The bridesmaids (in champagne coloured dresses) are getting in to the cars. 9:41: The Queen and Prince Phillip have left the palace – she’s in yellow, he’s in red – would it be impolite to say they’re colours I wouldn’t put together? 9:40: Princesses Beatrice and Eugenie are wearing what Lyn of Taw would describe as visual symphonies on their heads. 9:38: Prince Charles and Camilla, the Duchess of Cornwall, are on their way to the Abbey. 9:35 Prince Andrew, his daughters Princesses Beatrice and Eugenie; Prince Edward and Princess Sophie are leaving the palace. 9:33: Carole MIddleton and her son James have arrived at the Abbey. 9:30: The junior royals are travelling from Buckingham Palace to the Abbey. Mini vans don’t have quite the same impact as Rolls Royces or carriages. 9:26 – Carole Middleton, Kate’s mother, in sky blue is on her way to th Abbey. 9:24: In other news the Blues have beaten the Highlanders 15 -10 at Carisbrook. The Breakers have won the basketball final against the Taipans. 9:22: The fascinators many women are wearing are fascinating – and surely better for the people sitting behind you than a large hat. 9:20: The princes took off their caps as they entered the Abbey and are chatting to the Dean. 9:12: Princes William and Harry have left Clarence House on their way to the Abbey – William in red, the dress uniform of the Irish Guards. 9:05: British Prime Minister David Cameron and his wife Samantha hold hands as they walk into Westminster Abbey. 9:pm: Commonwealth leaders arriving including the Keys and Julia Gillard – the latter in pink. 8:25 My farmer is watching the rugby but I’m enjoying watching people arrive at Westminster Abbey. Earlier this evening Prime Minsiter John Key and his wife Bronagh showed off their wedding finery – she in a Trelise Cooper pink lace dress with a royal blue coat and hat, he in a greenstone-washed merino suit. Tv3 here; TV 1 here and here. 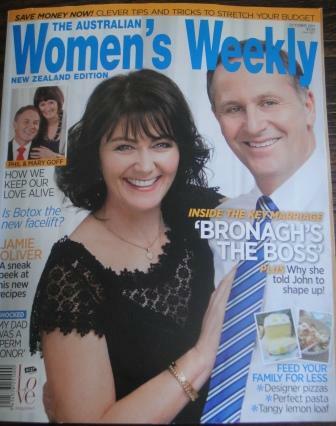 Just a couple of week’s into John Key’s tenure as Prime Minister and the fashionistas are after his wife Bronagh. Her fashion crime? Wearing the same outfit twice. It’s just as well I’m not in a position which brings me to the attention of the fashion police because not only do I wear the same outfit many times I do so over many seasons. If it wasn’t for a problem of wardrobe shrinkage (when you hang clothes in the wardrobe and find they’ve shrunk when you try them on a few months later) I’d be wearing them for a lot longer. Bronagh appears to be a confident woman, comfortable with who she is and what she wears so I hope she ignores the unsolicited advice. Wearing something more than once isn’t a fashion faux pas, it’s displaying environmental and financial sense. We’re continually being exhorted to reduce, reuse and recycle so wearing an outfit just once is simply wasteful and when we’re facing the worst financial crisis for decades it could also be regarded as profligate. The fashionistas should stick to kitting out those who seek their advice and leave attractive and well dressed women like Bronagh to enjoy their own style, which includes wearing outfits as many times as she likes. That way she’ll be a role model for the majority rather than a fashion horse for the few because while the fashion police have a vested interest in getting women into new clothes as often as possible that’s neither sensible nor possible for most of us. UPDATE: The Hand Mirror and Kiwiblog also comment on this. UPDATE 2: goNZo Freakpower writes from experience.